This chapter introduces the main purpose of this book. It also gives the historical background of the Muslim community in Sri Lanka. It explains the diversity within the Tamil community in Sri Lanka and how Muslims started to identify themselves as Moors. This chapter also gives an introduction to pre-colonial times and colonial times in Sri Lanka. From the perspective of the Muslim community in Sri Lanka, this chapter also gives the reader an introduction to the civil war and post-war conflicts involving the Sri Lankan community. 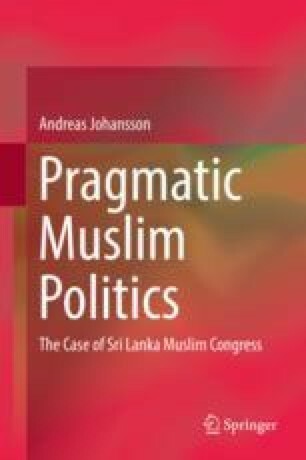 This chapter also has an introduction to the political party that this book analyzes, namely, the Sri Lankan Muslim Congress. In this chapter the reader will also get an introduction to some or the theoretical points of departure in this book. The chapter ends by discussing the source material upon which this study is based as well as how it is analyzed. The three types of sources are: interviews, parliamentary speeches, and official documents from the SLMC. They will be analyzed separately in the following chapters and will then be compared in the final chapter. The different forms of source material not only give a widespread empirical base but also correspond to the overall aim and questions posed by me in this book. BBC. 2004. Muslim girl shaves head over ban. BBC News Europe. Retrieved October 3, 2013 from http://news.bbc.co.uk/2/hi/europe/3708444.stm. Census of Population and Housing 2012. n.d. Retrieved March 3, 2015, from http://www.statistics.gov.lk/PopHouSat/CPH2012Visualization/htdocs/index.php?usecase=indicator&action=Map&indId=10. Centered Political Parties Parliamentary General Election – 1989. Retrieved October 29, 2012, from http://www.slelections.gov.lk/pdf/Results 1989%20GENERAL%20ELECTION.PDF. Department of Election Retrieved October 29, 2012, from http://www.slelections.gov.lk/ep.html. Hansard Department. Retrieved July 30, 2015, from http://www.parliament.lk/en/component/organisation/dept/departments?depart=4&id=4&Itemid=107. ———. 2015. Sri Lanka. The Encyclopaedia of Islam, 3rd edn. Retrieved August 4, 2015, from http://referenceworks.brillonline.com/entries/encyclopaedia-of-islam-3/sri-lanka-COM_27597. SLMC “Our History”. Retrieved April 2, 2013, from http://slmc.lk/about-us/sri-lanka-muslim-congress/. Weerarathne, Chitra. 2013. Ranil, Tissa restrained from acting against SLMC MPs. The Island. Retrieved October 27, 2013, from http://island.lk/index.php?page_cat=article-details&page=article details&code_title=73022.